The clean lines of this pergola provide a shaded retreat in this compact backyard without overpowering the space. The stucco columns match the home and complement the linear design of the modern fireplace. According to the dictionary definition, a pergola is an arbor that is built with horizontal beams or trellises and is supported by columns or post. The purpose of the structure is to support or train vines or other plants to grow upward. But in the Phoenix area, a pergola is far more than just a structure to support plants. Pergolas are often the shade structure of choice used to create a protected relaxation oasis. These structures can be built with an open trellis like ceiling and are most often made from large wooden beams and wood rafters. The support for the rafters is provided by four large columns or posts which allow all four sides to remain open for easy access. 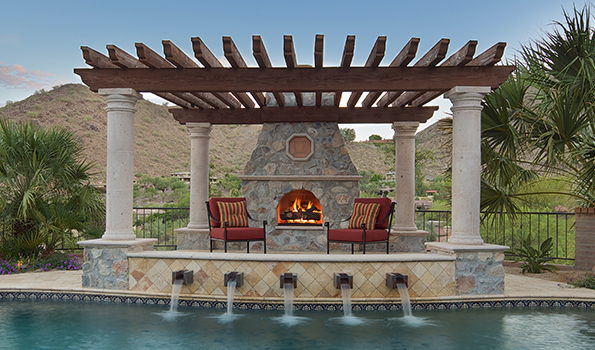 To learn more about Arizona pergolas, call 480-969-1911 to schedule a free no obligation design consultation with a UNIQUE designer. One of the biggest benefits of a pergola is that this shade structure can be constructed almost anywhere on your property. Unlike a covered porch or patio, a pergola can be located away from your house and provides a 360-degree view of your surrounding landscape and outdoor living features. Pergolas are often installed near a swimming pool, spa or splash pad to provide a shaded retreat for family and friends to enjoy in the heat of the Arizona summer. 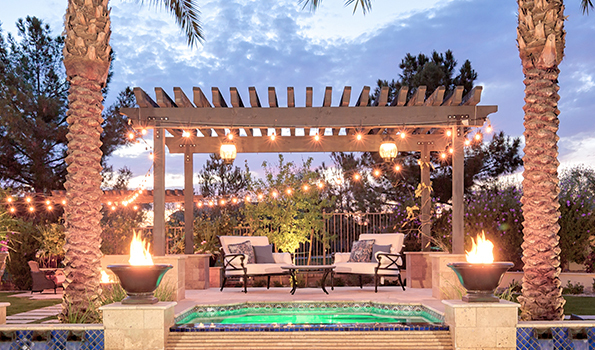 And with the addition of lighting, a pergola provides the ambiance for a quiet al fresco dinner throughout the year. This pergola is constructed of traditional wood posts and beams, but the posts are anchored to mini-pillars which are used throughout the landscape. Custom lighting adds to the ambiance as the sun begins to set. As mentioned before, pergolas are most often constructed of wood, but that is not to say that wood is your only choice. The design team at UNIQUE Landscapes will be happy to work with you to custom design the pergola of your dreams. As a licensed general contractor, UNIQUE is fully qualified to build your shade structure to your specifications and taste. In some cases, the rafter of the pergola is constructed of custom ornamental iron to create a more ornate filigree pattern. Other options include creating support columns that match existing architectural features on your home or even installing custom carved posts. But regardless of the custom features and design requests, you will have the peace of mind of knowing that your pergola is also engineered for safety and structural integrity as Chris Griffin, the owner of the UNIQUE companies is a civil engineer and has held a license from the Arizona Registrar of Contractors since 2003. This ramada is the perfect location for an outdoor kitchen and living space. The roof is fully enclosed and the design mimics the architectural style of the home, including the matching roof tiles. While a pergola is a relatively open shade structure, there are also options that will provide homeowners with even more protection from the sun as well as other weather. A ramada is a structure that offers a fully-enclosed roof but is still supported with just four posts or columns. These structures are most often designed to match the architecture of your home and can include stucco columns, stacked stone, matching roof tiles, and decorative accents. And your ramada can include additional custom features such as a misting system, ceiling fan, lighting, a BBQ island and more. Ask your UNIQUE designer for tips and ideas about which features you might enjoy when planning your ramada. And if you are interested in a more rustic look but still want the benefit of some shade, a palapa could be just what you are looking for. These structures are more similar to a large umbrella than an actual building. A single pine-peeled post or multiple posts are used to support a canopy made of dried palm fronds. Palapas are often installed over a BBQ island or at an outdoor seating area to create a natural looking shade structure. This pergola creates an intimate seating area near the pool without blocking the magnificent view of the mountains. Traditional wood rafters are supported by classic stone columns with pillars that match the fireplace. Every good construction project begins with a good plan and a great foundation. It is critical that any structure including a pergola be professionally designed and engineered. Not only is this important for your safety and that of your guests, but it is also required when you are submitting your plans to the city for approval and permitting prior to the construction process. Each city can have slightly different requirements and it is important that your pergola is designed and engineered to meet the specific code of your city. It is also important that the footers that support your pergola are correctly designed and installed. These footings will be the foundation for your pergola, and when designed and built correctly, they will support the pergola for a lifetime. And finally, your pergola should be constructed using the same high-quality building practices that were used to build your home. Only licensed contractors should be hired to build any structure. This ensures the integrity of the structure and the safety and quality of the finished product. For answers to your specific questions about building a pergola, contact the UNIQUE design team to schedule a free consultation. 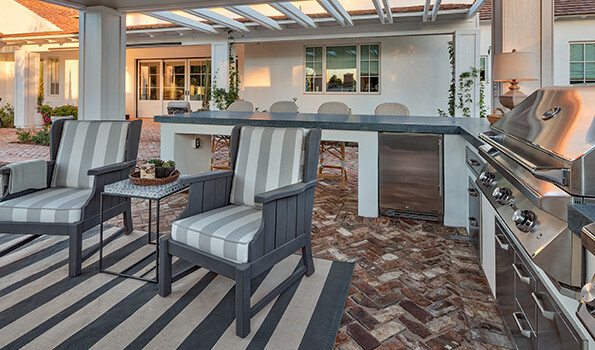 Outdoor living spaces are the perfect way for families to gather together and enjoy the fresh air, as well as some much needed time to relax and enjoy each other’s company. 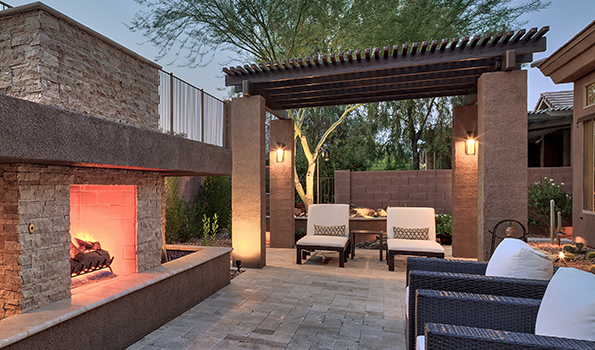 And if you are one of the many families who gets to enjoy a custom outdoor oasis that was created for you by the UNIQUE Companies, then you know that outdoor living is what Phoenix is all about. And early spring is the perfect time to get your outdoor living spaces ready to enjoy this summer. The great news is that the amazing structures and features that UNIQUE builds will last for decades and only need a little spring cleaning to be ready for another season of fun in the sun. But to add a new twist to your outdoor living spaces, pick a bright, cheerful color to be this year’s new accent color. A few outdoor throw pillows and maybe even a new outdoor rug will add interest and make the space feel cozier. You might even carry the new color through to your BBQ island with new bright colored utensils or a new umbrella in a jewel tone. New bar stool cushions can also add a pop of color and some added comfort when dining alfresco. And don’t forget the new toys for the pool. Floaties, frisbees, and noodles are a must for any pool that will be entertaining children this year. A variety of insulated plastic cups will also be a big hit with the kids as the days get hotter and longer. New towels, flip flops and lots of sunscreen will also be on the shopping list for a fun summer that will feel like an endless staycation. When you are planning for the first big holiday BBQ, make sure that your grill is in good working order, that the gas line is intact and functioning and that you have cleaned out any remnants from last year’s last hurrah. If your grilling island has a flagstone surface, a good cleaning and the application of a masonry sealer will help to prevent stains from spills or other accidents. Finally, don’t forget the last member of the family who will want to be outside enjoying the summer with the family. Having plenty of water available is critical for your furry four-legged family members. This can mean water bowls strategically located or even an automatic water bowl that is attached to a hose spigot and keeps fresh water in your pooch’s bowl at all times. Also, remember that the doggies don’t have flip flops, but your walkways and decking will be getting hot enough to burn puppy feet very soon. When the air temps reach 100-degrees the pavement can easily reach over 130-degrees which is hot enough to cause second-degree burns on the paws of everyone. Investing a little bit of time in spring preparations will ensure that you and your family will be enjoying your UNIQUE outdoor living space all summer. 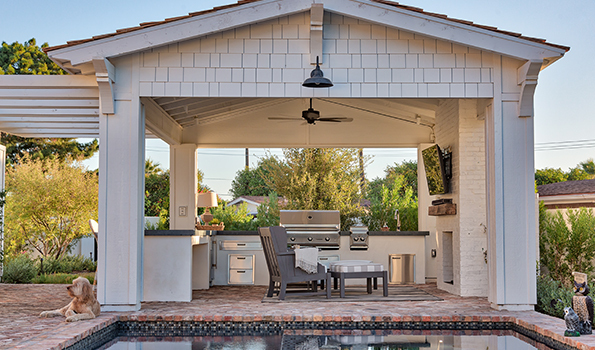 Having an outdoor kitchen in Arizona is about as important as having a swimming pool. It is a feature that can be enjoyed year round and is a great way to gather family and friends together for a meal. But most homeowners begin to lose interest in their grill when it’s time for a good cleaning. Either they decide to stop using the grill as often or they decide to use a harsh chemical to try to avoid the effort involved in scrubbing the grill clean by hand. But now there is another option that is simple, does not require harsh chemical and is environmentally friendly. All you need to easily clean your grill grates are a few items that are already in your kitchen and cost almost nothing. First, you need a lemon and some table salt. Next, carefully slice the lemon in half, from end to end. It is important to cut the lemon from end to end so that you have a larger surface area. Then, holding the lemon by the rind side, squeeze it gently so that it produces enough juice to moisten the entire cut surface. Next, sprinkle about a tablespoon of salt evenly over each half of the lemon and wait long enough for the juice to moisten the salt to help it adhere to the surface of the lemon. Finally, gently scrub the grilling surface with the salt covered lemon just as you would with a sponge. The acidity of the lemon and the grit of the salt will break down any grease and loosen any partials which were cooked onto the grates. After scrubbing the entire grilling surface with the lemon, use a damp towel to wipe the grate clean and another towel to dry the grates. To make grill clean-up even easier there is a simple and affordable trick to make the grates non-stick. Simply cut a regular potato in half and after the grill is fully heated, rub the cut side of the potato across the entire grilling surface. This will coat the grate and keep food from sticking. If you do not have a potato a halved onion or a halved lemon will work, but both of those items can leave a small amount of flavored residue on the grilling surface. Try both of these tips to make grill clean up easier and safer for your grilling surface and the environment. Paradise isn’t found it’s created. Contact us and we will create it for you! Unique Landscapes by Griffin Inc. Unique Landscapes & Custom Pools of Phoenix, AZ specializes in high-end landscape design and custom pool design. Our seasoned team of professionals consists of swimming pool designers, swimming pool builders and landscape architects that can create a resort-style, outdoor living environment for your home. We are licensed pool contractors, landscape contractors and general contractors serving Mesa, Scottsdale, Phoenix, Chandler, Gilbert, Paradise Valley, Tempe and surrounding Arizona Valley cities.